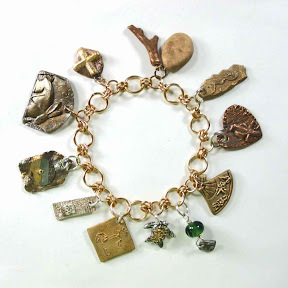 Once again, I’ll be joining some other members of the Western PA Chapter of the Precious (and non-precious…) Metal Clay Guild out at the Creative Marketplace that’s to be held in the Municipal Park (down by the Allegheny River) in Verona, PA this Sunday, June 1, from 11 am to 3 pm. I will likely take off by Noon, myself, but I’ll leave a collection of pieces under the care of my fellow guild members. If you’re in the neighborhood, please stop by! The photo with this post shows two of the pieces I’ll have for sale there. The rectangular one was made from Hadar’s “Dark Champagne Bronze” and I’ve embellished it with a “clear” CZ stone on this side, to add an extra bit of sparkle. 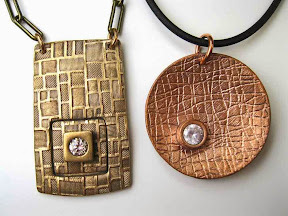 The round one was made from Hadar’s “Friendly Copper” plus a “lavender” CZ (which is more sparkly in person than this photo might lead you to believe; though the “clear” one is much brighter still…). On their “other” sides, the designs involve several layers, to add more visual interest through varying depths. Many of the pieces I’ll have for sale (including these two) were textured using some interesting vinyl wallpaper bits and pieces I was lucky enough to get last month at a “designer samples” give-away sponsored by the wonderful Pittsburgh Center for Creative ReUse. I’ve been having a lot of fun playing with those: the underlying texture and the printed-on pattern are often very different! The pattern is what your eyes first see on the sample, but it’s the texture that shows up on these pieces. And as you can probably see here, while some of the textures end up looking fairly rough, some come out all smooth and shiny, and still others can be polished to reveal interesting contrasts. Until I figure out for sure which samples yield which results, I’m sticking to making fairly simple pieces with them. 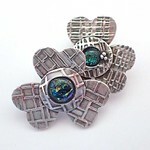 Most of the pieces are reversible (of course! ), but still just basic shapes with small highlights (rather than the more complex, and longer-to-make, ones like various hollow bead structures with different kinds of openings, channels, etc.). For marketplace customers, of course, that means these new pieces of mine will fall into the more “affordable” range this Sunday! So, if you’re in the area, and have a bit of time between 10 am and 4 pm on Sunday, I hope you’ll stop by. Do check out our Guild’s booth, but also take a look around at the other creative work being done in this area. Rain or shine, you should be able to find a very special gift from a local artist for someone special to you, or even a treat for yourself, something you’d never be able to find in a big-box / chain store. Because there will be all sorts of folks wandering around the neighborhood that day, it’s also the first day of the Wilkins School Community Center‘s Spring fundraiser, a Plant, Herb, and Used Book Sale from 10 am to 3 pm. (See the poster, above-right.) There are tons of books available but, if you want any of the plants, it’s usually wise to arrive early. And, because there will be all sorts of folks wandering around WSCC, I’m holding an Open House in my studio too, which is “upstairs, above the front door” at WSCC at the same time too. Then, on Sunday, WSCC will continue their Book Sale (with even better prices) and I should still be around much of the day because the Western PA Chapter of the PMC Guild will be holding one of their great Clay Play Days in the classroom next to my studio. In theory, WPaPMC will be there from 10 to 4 but, since we moved the session a week early (to avoid Memorial Day), I’m not sure if the group will actually stay there the whole time. But, if you can’t make it over on Saturday, feel free to try to catch me there on Sunday. I’ll be happy to re-open my studio if you want. The Sunday book-sale runs 12 to 3. 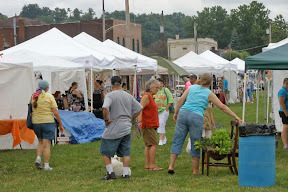 A group of folks up the Allegheny River a bit from Pittsburgh itself have organized a new artists market that they are calling the “Creative Marketplace.” It will be held in Verona, PA, on the first Sunday of the month, May through September. Which means that the first one will be tomorrow! The Western PA Chapter of the PMC Guild applied, as a group, and was accepted to be one of the 40 vendors at this event. Which means that our very first group show will be tomorrow too! A couple of our members, the most-seasoned show-vendors, were accepted to have their own individual booths. But, personally, I am really looking forward to being part of our group effort. 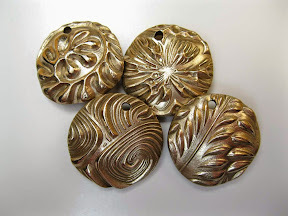 Some of us have a bit of show experience, while a few of the members who will be joining us are hobbyists who have never sold any of their metal clay creations. While I hope that I am able to sell a few pieces (a girl’s gotta pay the monthly studio rent somehow…. ), I really hope that our “newbies” will also get the thrill of having their work admired, and actually bought, by a complete stranger. Yes, your friends and family have been telling you they like your work: you want then to say that no matter how they really feel. But it’s such a treat to get that recognition by someone who’s got no other reason to say so. 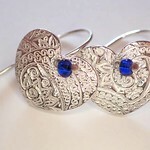 I still feel delight and appreciation when someone chooses to buy one of my creations! I hope I never lose that. If you’re in the area, and have a bit of time between 10 am and 4 pm on Sunday, I hope you’ll stop by. Do check out our Guild’s booth, but also take a look around at the other creative work being done in this area. 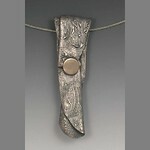 Find a very special gift from a local artist for your mother (Mother’s Day is fast approaching! ), for another family member or friend, or even for yourself, something you’d never be able to find an a big-box / chain store. I often intend to write at least a quick note about meetings of the Metal Clay group in Western PA, but then I forget to take any photos and, without those to jog my memory, I then forget all about the good intentions I had. But, on Sunday, I did remember to take camera and grab a handful of quick snapshots, so here are a few things we did at our last meeting. We called it a “Clay Play” day and, while some of us did exactly that, there was more than clay involved too! We try to have a “special topic” at each meeting. For this, someone will offer to demonstrate a technique that at least a handful of members are interested in either discovering (if they’ve never tried it before) or learning more about (if they have some experience but want to talk about it with others who are interested in the same topic). 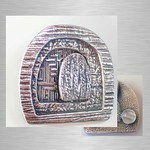 This may involve metal clay, specifically, but often it addresses some other skill that may be useful. This month, our topic was drilling holes in glass and stones. 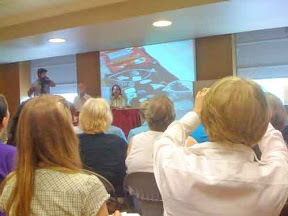 The first photo (above, right) shows Debbie doing one of several demonstrations of this. 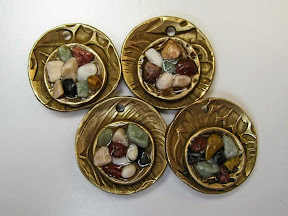 She brought a bag full of stones and beach glass that she’d collected on the shores of Lake Superior last summer, ones that were a good “shape” for beginners attempting this task, and let those who were interested have a go with her equipment. She also assembled a one-page handout that covered both the steps involved and the tools used. Thanks, Deb! I’ll have to raid my collection (currently displayed in a glass vase at home) that I picked up the last time I lived in California and would go walking along the shores there. Some of the nicest ones I have came from Moonstone Beach (near Hearst Castle). Michelle is our “local advocate” for using the Sihouette Cameo cutter in all sorts of ways. She generously brings her set-up to most “play day” sessions (shown, middle left). 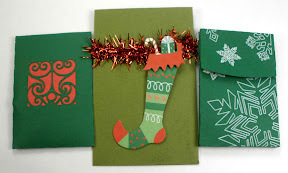 This time, she brought cardstock from which she cut boxes she uses for selling her Rose Gold and Green Gold clays, and let that run while we did other things. But she also does demos, answers questions from folks wondering if this might be a tool they would use, and even lets folks try out some ideas to see if they might want to take the plunge. Thanks to Michelle too! We also have a round of Show & Tell at each session. Shown last (lower right) is Sharon, who had just gotten back from a 2-week vacation mere hours before our meeting began. Despite having gotten little sleep during that return trip, she came because she wanted to participate in the stone-drilling activity! She did have a few new fine silver creations to bring, but also displayed a nice collection of bracelets she had beaded at the beach. Will your husband let the rest of us all come with you next year, Sharon? As for me, no photos yet of what I did, but they’ll show up eventually. In addition to participating in everything else, I had a very productive clay-play day. I made all the elements I’ll need for a dozen pairs of earring and a half dozen pendants. The latter all need to have a few simple embellishments added before they can be fired. I have double-duty plans for some of these pieces. As part of the accreditation program for Hadar’s Clay teachers, I need to do a series of kiln-tests, using different clays, and record the result. Hoping that mine will come out OK (or, at least, that I understand the parameters well enough that most of them will), I’m going to risk a few of the simplest elements in those tests. If I do have a few failures, I didn’t invest much time or clay in these, so any “loss” will be minimal. More importantly, though, all of the pieces have designs that involve pollinators of various sorts, so all of the ones that do survive can go into the collection I’ll be taking out to the Western PA Garden Marketplace on April 20. How good is that?! I’m just back from the (last ever) PMC Guild Conference, held just outside of Cincinatti, Ohio. 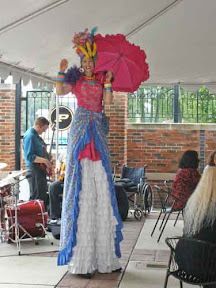 The very BEST thing about the gathering involved the interactions among all the participants. Whether it was a presenter sharing information, an audience member asking or answering a question, folks in the vendor’s hall doing a demonstration, or all the interactions among everyone at the various social events (including out in the swimming pool under the stars late at night) … well, those interactions are the things that make this such a valuable event. 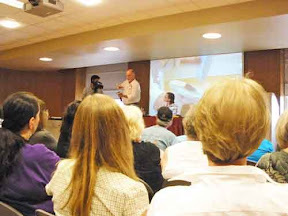 Blogs, websites, newsgroups, Facebook, online workshops, etc., are fine, but nothing like that wonderful, live, personal interaction among the hundreds of attendees. And seeing everyone’s “bling” live, for real, in person! Yes, many of the initiatives that the PMC Guild and Art Clay Society started have been picked up elsewhere. But not the big conferences; at least, not yet. And I’ve always found those to be very special events; and, coming from someone who generally prefers small groups to crowds, that’s really saying something! A girl can hope that good, strong, viable alternatives will re-appear in the next year or two…. Because I found that electronic-versus-human difference to be magnified even further by what I consider the worst part of this year’s event: the extremely limited ‘net access at the meeting site itself (especially since it had promoted its “Free WiFi” as part of the service). I really had hoped to get started on at least some new posts while on the road immersed in thoughts of metal clay (a few to finish and post immediately, and others to continue working on to post over the next week or two). But those posts just didn’t happen, and my schedule now is jammed up. I’ll try to get a couple of posts going, but it may be a few weeks before I can get back to any real writing. Since I want to end this note with a positive thought, more in keeping with my overall positive feeling about the event, I will end with a photo from Tim McCreight’s “History of PMC” talk, showing him with CeCe Wire. My guess is that this was taken in 2006? Anyway, I’ve enjoyed learning things from both of them (whether it was when we agreed, or disagreed, about the best way to approach a construction…). There’ll be more here about other people and interactions, plus news about my own workshops and projects, as soon as I can find the time. In the meantime, regarding the title of this post: yep, the direct human interaction won, for sure! Fifty for the Charm Exchange! As I’ve mentioned several times in the past (both here and here, and maybe elsewhere…), one of the regular events at PMC Guild conferences has always been an evening reception that involves a charm exchange. For the conference this year (the last one ever of this particular group, since it is disbanding at the end of this week … but those details will have to wait for another post! ), no time was allocated for it. So no one knew whether or not to stock up on charms in preparation for the exchange. Then, at pretty much the last minute, a way to do the exchange was decided upon by a few people who were going … and, presumably, already had a stash they were wanting to trade! Those of us who did not have much of a stash ready were left to assemble ours amidst the flurry of other things involved in preparing for the trip. They are all similar, but no two are alike! And, of course, this being me, they are all reversible. I call them “Moonlit Garden” charms, not just because I cut them in a waxing/waning moon shape, but also because they have a sort of moonscape texture on one side, and some sort of garden-theme texture on t’other (cherry blossoms, gingko leaves, roses, ferns, or various daisies). 65% were tumble-polished and left all shiny. both colors were lightly hand-polished in the hope of maintaining a bit of their lovely but random kiln-coloring. 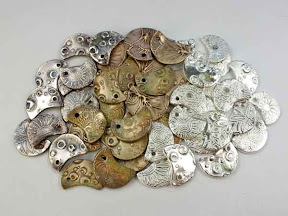 The silver costs more in raw materials, but the bronze ones take longer to complete. At what I figure is a reasonable rate for my time, they come out at about equal in value to me. I still need to find the little grab-bag I used last time to haul them around in, so anyone who wants to trade can just reach in and get whichever kind their hand is drawn to. And now that I’m over the concern about whether I’d manage to finish them, at last I’m able to look forward to seeing what I might get in exchange! Might yours be one of them? I’ve been doing Metal Clay demos at Art All Night for five years now. 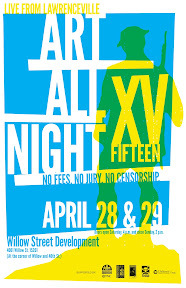 We actually announced the formation of our local guild-chapter at a previous Art All Night, with our first meeting scheduled for about two weeks later. In subsequent years, I have been joined by anywhere from one to six other members of the group. With me this year were Alice Walkowski, Debbie Rusonis, and Donna Penoyer, putting on a little metal clay show for about five hours on Saturday night. Yes, after a warmer-than-usual March, our April weather has been very fickle, and Saturday night in an unheated building turned out to be a particularly cold undertaking! 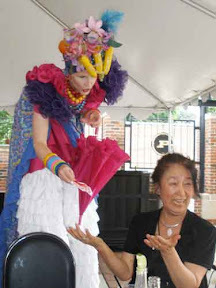 Though, of course, our hearts were warmed by all the visitors! We really did enjoy talking with the different people who stopped by our table. We were located in a somewhat challenging spot to find: you had to either work your way down a row of exhibits and then through the entire hands-on activity section for children, or else find the “back passage” through the show. One thing that did draw some people to that back passage was catching a glimpse of the “artists in residence” down in a sort of pit just beyond our spot. I really thought I had taken some photos of them, creating pieces on-site, but now I don’t see any on my camera. Oops…. Though I’m sorry that a lot of people never made it down to where we were, the nice thing about how it worked out this year was that we had a great opportunity for some extended interactions with the folks who did stop by. Since you probably can’t see much detail inside the frames on either of our entries, here are some photos we’d each taken earlier. 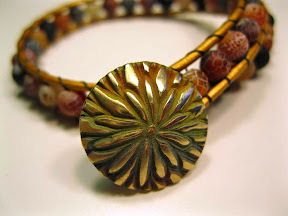 First, there’s a shot of Alice’s piece, Diving with Pearls (with fine silver and a CZ, plus pearls and ceramic beads) that she took and I found on her blog, followed by my entry, a reversible pendant (in yellow bronze, rose bronze, and copper) called Three Flowers … with a Twist. How I Spent Last Weekend. 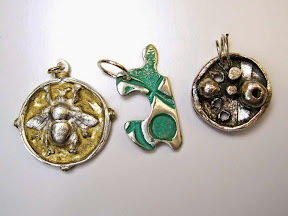 With a bit of island-themed whimsy, in honor of the workshops led by Gordon Uyehara at the Valley Art Center in Chagrin Falls, OH, last weekend, I open this post with a photo of the “Cosmic Honu” turtle pendant made last Saturday by one of my local guild-friends, Michelle Glaeser (who is also the developer of rose gold clay), checking out the “Pearl Box” ring that I made on the Sunday. As I’d mentioned in my last post, not everyone who went had been able to stay for all the events, but Michelle and I met at my studio for an hour or so a few days later to talk about the different workshops each of us had taken. There are several ways to approach the making of a ring using metal clay, and this class from Gordon uses the method I practice the least myself. So, why did I take this class? First of all, I wanted to push myself to practice this method. 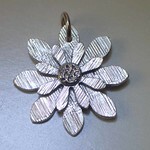 Even though I don’t find it particularly easy, if you look at book and magazine articles plus a range of on-line posts, it appears to be the one most commonly used by metal clay artists. (I don’t know how many are just starting from the same point they first learned and extending that for their project, or if they have tried others and simply prefer this one. It is the first method I learned too, but I later figured out, read about, and otherwise explored others that I find easier (not necessarily quicker, just easier) and have, myself, mostly expanded on those. I guess I’d better think about making, and writing about, some of those this winter….) In the meantime, rather than struggle on my own to master this technique, I figured I’d take it (again) from someone reported to have many happy customers (both product buyers and workshop students), and maybe I’d be able to pick up a few tips I’d missed. Besides, there can actually be two ring-bands in this particular design: one that goes around the finger and another that goes around the decorative top. So, this offered double the practice all in one day! 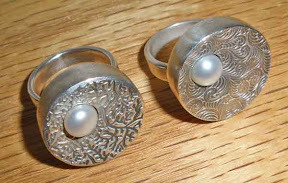 The finished samples Gordon brought, one of which was shown in my last post, all had the pearl set into a flat-topped, circular box, with the pearl off from the center of the box but positioned centrally in line along the finger when worn. 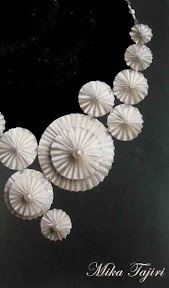 He also discussed, had unfired versions of, and constructed during demos, some other styles: different box shapes, different top-shapes, various wall heights, with the pearl positioned in different ways (e.g., centered or offset relative to the top or to the textured design). At the right, in a snapshot that shows eight of the sixteen pieces that participants made (one kiln-load), you can get a clue about their choices: I can see oval, oblong, and triangular as well as circular, and having flat, curved, or fully-domed tops. the whole box deliberately set ever-so-slightly off-center on the band (both left-to-right and front-to-back) because it just seemed while I was assembling it as though it would sit nicely that way (too far off might want to topple, but a tiny bit off just felt better to me). But another, even-funnier thing is that, without us ever discussing any of this during the session (because we were so busy working away on our own projects), both Alice (another local guild-friend, and my traveling companion for the weekend) and I made almost identical choices all along the way! (And this is not her typical style either, which usually has lots of curls and swirls.) 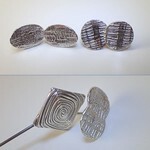 We had brought different textures to use, and hers (left) was one that comes out a tiny bit deeper than mine (right). Other than that, however, I don’t think we could have made more-matching rings if we’d tried! We had a good laugh when we each saw what the other had done…. Where I Spent Last Weekend. 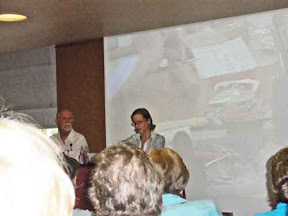 There were a number of other sessions too, for which I have no photos (sigh…). 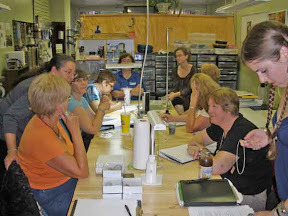 The other major hands-on workshop, led by Ohio-based artist Catherine Davies Paetz, covered making a series of carved, seamless rings (stackable, if you wanted to wear them that way) using PMC Pro. Other scheduled sessions involved topics like design, photography, and flexshaft maintenance. And there was a big pot-luck dinner on Saturday night. Now, it just so happens that all this got scheduled over days when I had tons of stuff already going on. And, in fact, I wasn’t the only one! So, while a few people stayed for the entire four days, there were lots of others who did their best to find an opening somewhere in their schedule when they could participate in at least some part of the weekend. Though that posed a bit of a challenge (would all the costs be covered by the registration fees that had been set?!) in another way it was OK: because there were a few openings, it was possible to accommodate requests from others to join the fun, which ended up including folks from Colorado, Maryland, Florida (and those are just the ones I caught; there may have been others). So, on Saturday I drove up to Franklin, PA, to meet with Alice Walkowski, and we headed over to Chagrin Falls together. On my way to Alice’s, however, I hit a major traffic jam. I knew there was construction and, based on previous trips through that area, I’d factored in a 40 minute delay; online sites I checked en route then told me it would set me back 45 minutes; there is an alternate route, but it normally takes 45-50 minutes longer than the other route and due to lots of traffic lights, so I figured I’d risk the interstate construction for an easy drive the rest of the way. Wrong decision! In reality, that single three-mile stretch added well over two hours to my trip!!! But we still managed to arrive in Chagrin Falls just in time to make a quick stop at the delightful Village Herb Shop. I wanted to get there because it’s a great source for edible flowers (which you should know by now that I love to cook with). But I mention it here specifically because they also carry the lavender oil that many metal clay artists use in joining pieces of metal! In fact, they carry both the essential oil (alone) and a tincture (with alcohol), in several sizes. I already have a bottle of that, but this time I picked up some organic edible flowers, both in the Village Herb Shop’s special mix (where I may have gotten the last jar of this season! ), and some separate, individual varieties (including some delightful little button roses whose petals can go into my next few batches of rose petal ice cream!) Alice is not quite the edible flower fan that I am but, while I shopped, she explored the yarn shop upstairs and the garden outside. So we were both happy with that stop. After we were done there, we headed over to meet up with all the various guild members for that delicious pot-luck dinner. We spent the night in a near-by hotel, and were thus able to arrive promptly for a 9 am start for Gordon’s “Box Ring with Pearl” workshop. More about that in my next post. We set up some other rules too, though we’re not at all strict about enforcing them. 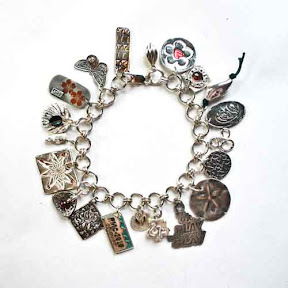 One of the so-called rules for this one was to make your charms follow a theme that represented some aspect of either Pittsburgh or southwestern Pennsylvania. Your choice how to implement that. My charms, above, incorporate three ideas. First of all, the overall shape of the charm itself refers to Pittsburgh’s history as the “Steel City.” It is loosely based on a part of the logo for both US Steel (based here) and the Pittsburgh Steelers. The embellishments on one side are meant to represent the “Three Rivers” (where the Allegheny and Monongahela Rivers join to form the Ohio river, which flows into the Mississippi and then on to the Gulf of Mexico). Historically, that confluence was a major factor in much of the development of this area. The branching design on the other side, in one way, could be taken as reinforcing the rivers-theme but, even more, it is my way of noting the oft-repeated comparison that Pittsburgh does not always feel like a city, but more like a “big small town” in the way people connect to and interact with each other. 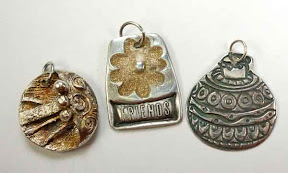 One of our members, Barbara, had made charms for the exchange but was at the last minute unable to join us. So we managed to let her participate in absentia, and I am holding onto the ones that were drawn for her until she can get over to pick them up. Two of the charms Barbara got are shown above. The one that I really had trouble getting even a halfway decent shot of (because of its smooth texture and bright shine) is an adorable Pittsburgh Pieroghi that Sally made. The other, with a holiday-theme instead of Pittsburgh (see what I mean about following, or not, the rules?) is a great little Christmas tree ornament from Lois. Both Barbara and I got one of Michelle’s charms (below, left). She didn’t actually follow the rules either, but admits that after the fact she came up with an explanation that almost works. Michelle moved here just a few years ago from New Mexico, and still marvels at the brightness, intensity, and color range of autumn leaves in this area, so her charm with an autumn leaf and a little acorn fits that part of it (even though the majority of it is not made from some form of metal clay … which was another (unenforced) rule). The other charm shown above is the one I got from Alice, with her impression of the Smithfield Street Bridge in downtown Pittsburgh. (Another rule was to ID your charm on the outside of its package, so people could re-choose if they got a charm from someone they’d already exchanged with. Alice, like several other participants, ID’d hers on the inside…) Even though I had earlier exchanged with Alice, I’m glad I got that one: for a number of years I worked right at the end of that bridge (for two different companies, both in the same building, between the two different times I spent in grad school), and I walked over it regularly. 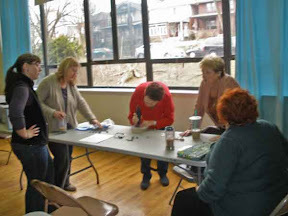 The Western PA Chapter of the PMC Guild held its inaugural meeting in May of 2008 in the Trevanion Room of the Wilkins School Community Center–the same center where I now have my studio. At that meeting were the three founding members (me, Donna Penoyer, and Jan Durkin), along with four other charter members (Alice Walkowski, Karen Haugh, Laura Tabakman, and Stacey Carulli who was representing Beyond Beads). 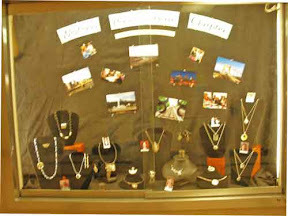 In both 2008 and 2009, the shop Beyond Beads hosted our holiday season meeting but, between our growth and their move to a location with less meeting room, we were not able to hold it there this year. Not to worry, I thought (way back, months ago, before I’d actually moved into new studio), I can now just offer to host that one. Although we have over 60 local “members” in our online community, we rarely get more than about twenty at any one particular meeting. We’re actually delighted with our current size: big enough to have a great mix of people, but with a small enough regular attendance that we can still fit into a range of different sites! What with the first serious cold snap and snow of the season, a series of nasty “bugs” going around, and all the activities this time of year, I was delighted when sixteen members still managed to get to our annual “Holiday Season” meeting on Wednesday night. We could have squeezed in a few more, had they shown up, but sixteen was just about the right number to fit in, ah, cosily. The photos with this post were taken during a break for refreshments and small-group discussions. Our meetings always start with a “show & tell” session. Particpants show off their latest creations and talk about making them: new techniques tried, problems encountered, work-arounds involved, lessons learned, etc. Others are free to ask questions or offer suggestions. Lots of ooh-ing and aaah-ing is involved. New rings, in particular, seem to get delayed in their trip around the table, as people try to figure out which finger they best fit and how they feel, as well as how they were made. If you weren’t at the meeting, you can see photos of a few of the rings and other pieces that were passed around, such as two of the rings Donna Penoyer made for Whole Lotta Whimsy’s Master Muse projects, and one of the rings and a couple other pieces that Holly Dobkin made for Morgan Contemporary Glass’s annual Teapots! exhibit. (If any other members have relevant online-links, please let me know and I’ll be happy to add them here.) My major new creation for the Show & Tell this time, of course, was the studio in which we met! 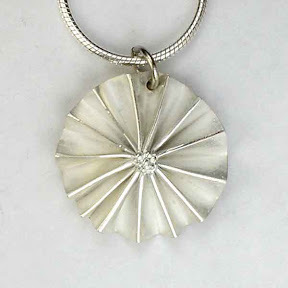 Lindsay Newell, who came to join us after a number of years doing traditional metalsmithing (using sterling silver) had requested a demo and discussion on making fine silver bezels. 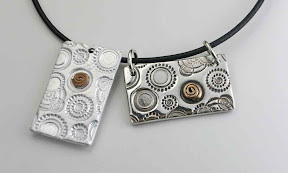 Several other members generously met that request: Donna P demonstrated several techniques and issues with using fine silver bezel wire; Michelle Glaeser demonstrated the use of PMC+ sheet clay on a metal clay backing piece (one of the “Jen Kahn” approaches). In both, other members chimed in with additional questions, tips, and more. If I can find the time in a few days, I’ll add another post discussing some other items from that evening. For now, however, I close with the thought that, in this season of giving, then, I want to thank everyone who gave something to help make that evening such a success. What is it with weekends as summer draws to a close, so jam-packed with all sorts of things “to be fit in” before the season ends? This past weekend was one of those. I’ll mention a few of the more relevant events. On Satuday, I went to the InterGalactic bead show as it passed through town. I didn’t buy very much: the thought of picking up much of anything that I’d then have to move at the end of the month when I get my new studio put some brakes on those tendencies. I did buy a few tools, ones that I’ll discuss later, once I’m settled into studio and happily using them. And I bought a couple little pieces to use in displaying work in that studio. I was really trying to resist buying beads, though I did pick up one quartz piece and a few hanks of crystals (sample shown right). On Sunday, our local chapter of the PMC Guild met for a “field trip” to the Carnegie Museum. Nominally, it was to see the current special exhibit, “Pittsburgh Adorned,” but the best part was that you had to pass through the wonderful halls of Minerals and Gems to get to that. We checked out a few other exhibits quickly and had a short business meeting over drinks in the “Fossil Fuels” cafe (which you access by going through the Dinosaur Hall…). Then, most folks headed home, while Barbara and I (we’d carpooled) decided we had enough time left to head down for the tail end of the grand opening weekend of the Pittsburgh Public Market. Interesting food and crafts but, for local readers of this blog, probably the best news is that the wonderful Zelda’s Bead Kit Company has a booth there too!